For NASA’s Mars Science Laboratory (MSL) and its Curiosity rover to carry out their mission of assessing whether Mars ever had an environment able to support life, it had to land in just the right location, where potential evidence of past water was visible and plentiful. The mission that did the most to help NASA find that location – Gale Crater – was the Mars Reconnaissance Orbiter (MRO). 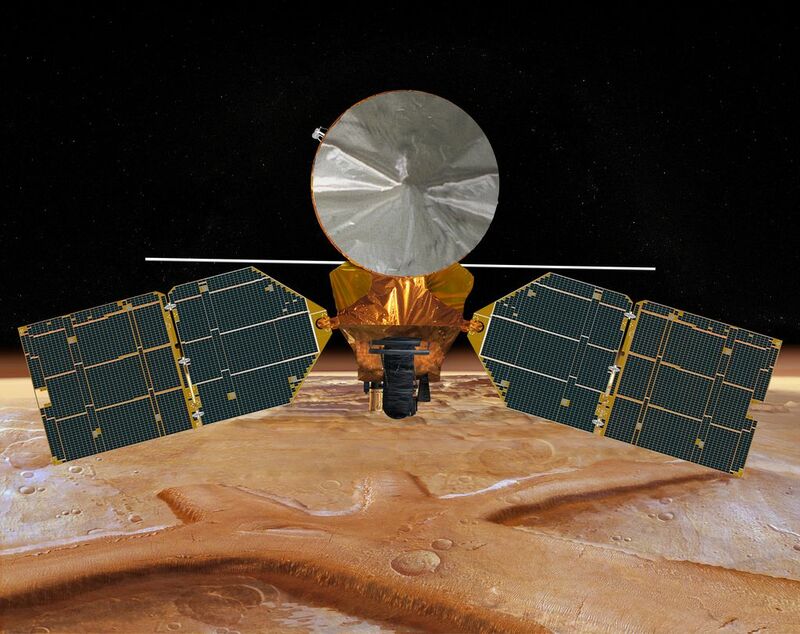 One of the two key imaging instruments on MRO that provided the deciding data was the Compact Reconnaissance Imaging Spectrometer for Mars (CRISM), designed and built for NASA by the Johns Hopkins University Applied Physics Laboratory in Laurel, MD. NASA's Mars Reconnaissance Orbiter (MRO), carrying the Compact Reconnaissance Image Spectrometer for Mars (CRISM), blasted off from Cape Canaveral in 2005 on a search for evidence that water persisted on the surface of Mars for a long period of time. MRO entered Mars obit in 2006 and has been providing high-quality science data for more than seven years. CRISM creates detailed maps of the planet’s surface mineralogy using a technique called reflectance spectroscopy, which measures differences in the way minerals reflect sunlight across the electromagnetic spectrum. CRISM identifies minerals on the Martian surface that indicate past volcanism, the past existence of water, and in some cases where rocks have been altered at depth by heated water. “What we’ve learned is that there are many places where water persisted on the surface of Mars or in the subsurface long enough to leave a chemical fingerprint,” says CRISM Principal Investigator Scott Murchie, discussing the findings of the 20-year-old Mars Exploration Program (MEP). “Water that could have been suitable for living things was most prevalent in the ancient past – before 3.7 billion years ago.” But in Mars’ later history, what limited water remained was so salty and sulfur-rich that it was more like battery acid – more useful as disinfectant than in supporting life. By 2.5 billion years ago, Mars had mostly dried out. A close-up of the interactive map of Mars containing the high-resolution observations made by CRISM to date. The perfect hybrid of interesting geology and safe access turned out to be a mound of layered rocks at a place unofficially called Mount Sharp (its formal name is Aeolis Mons) in Gale Crater, located just south of the Martian equator. Maps generated by CRISM and MRO’s super-high-resolution camera, the High Resolution Imaging Science Experiment (HiRISE), suggested that in climbing up the mountain, the rover could work its way through Mars’ history, starting with clay sediments in the lowermost layers, move up through sulfate minerals that formed under acidic conditions, and arrive at dust deposits at the top of the mountain from more recent history, after the planet had largely dried out. The selection of Gale Crater as the MSL landing site unfolded over a series of five workshops that spanned five years. The first workshop to explain MSL’s capabilities to scientists researching Mars and to solicit their ideas on landing sites took place in 2006, before data from CRISM were available. From this first meeting, about 30 sites were proposed. 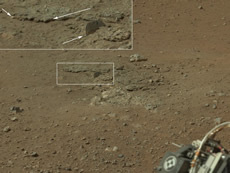 This color image from NASA's Curiosity rover shows an area excavated by the blast of the Mars Science Laboratory’s descent stage rocket engines. 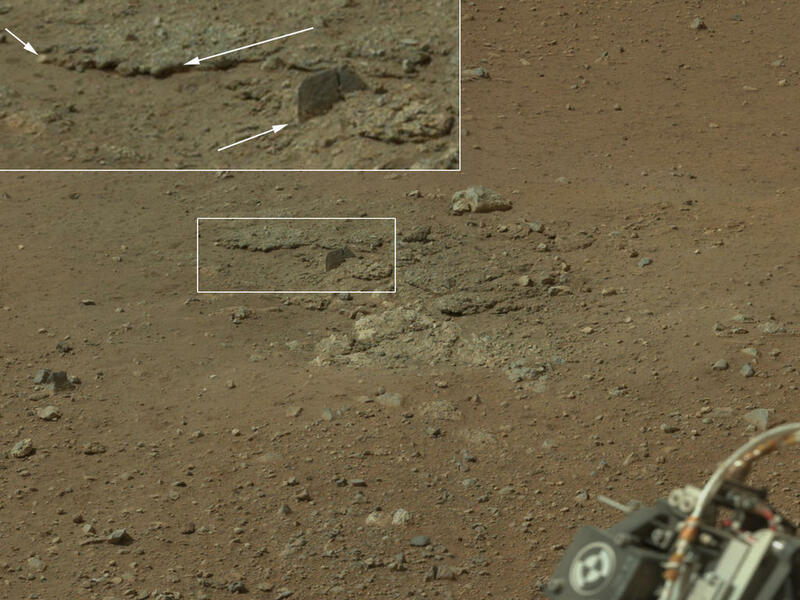 With the loose debris blasted away by the rockets, details of the underlying materials are clearly seen. Of particular note is a well-defined, topmost layer that contains fragments of rock embedded in a matix of finer material. Shown in the inset in the figure are pebbles up to 1.25 inches (about 3 centimeters) across (upper two arrows) and a larger clast 4 inches (11.5 centimeters) long protruding up by about 2 inches (10 centimeters) from the layer in which it is embedded. In the subsequent workshops, the CRISM and HiRISE teams and other scientists from the Mars community presented their data covering each of the proposed sites. By the fourth workshop in 2010, the list had been collectively whittled down to four sites where there was evidence of past water and where there may be a chance of finding preserved organic material. About a third of the workshops’ presenters were part of the CRISM team, and they are still supporting Curiosity now that it’s on the surface of Mars. The MSL team has been using CRISM data to make geological maps of the landing site and select where to drive the rover and which outcrops to investigate. When Curiosity landed, the rockets blew the dust off of nearby rocks; the team has measured the spectrum of these areas so that the rover’s direct compositional measurements can test, and hopefully verify, the MRO team’s distant interpretations from orbit. With NASA’s announcement late in 2012 that a new Mars science rover will launch in 2020, MRO’s data will continue to be critical in the selection of landing sites for Martian exploration – and CRISM will remain a valuable source of information about the surface mineralogy of Earth’s most-studied neighbor.